All the swims have a good access over a hard gravelled path. "A great lake Friendly owners (sraff) This is where you go for on a fisching holiday"
"more toilets required as you arent allowed your van at the swim and the toilets are located to far from the lake. We had a nice week." 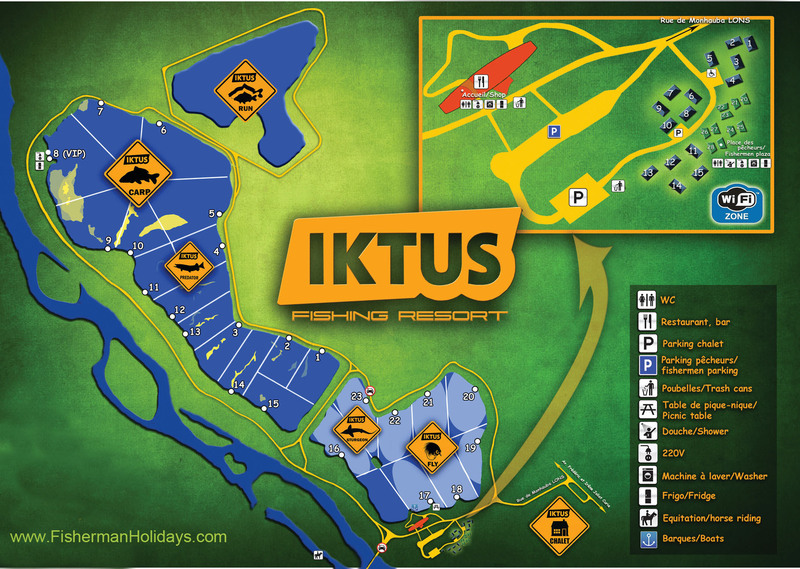 In southern France, near the city of Pau (Aquitaine), lies the carp fishing venue called Iktus. The property has a total surface of 140 Hectares (350 acres) with 3 lakes: Iktus Carpe (87 acres), Iktus Sturgeon (40 acres) and Iktus Run (25 acres). 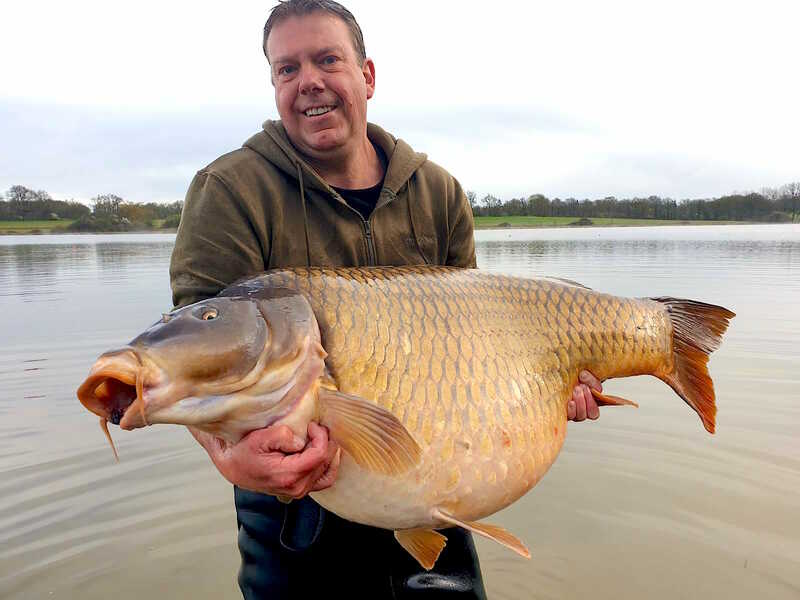 This 40 year old venue features a restaurant, small tackle shop, a facilities building, bungalows, a secure perimeter with 24/7 surveillance and, of course, a superb stock with carp up to 33,4kg (73.6lb). For the non-fishing guests there’s plenty of activities such as horse riding, golf, tennis, squash, bowling, karting, shopping malls, etc. And the Pyrenees are only 30 minutes away from Iktus. 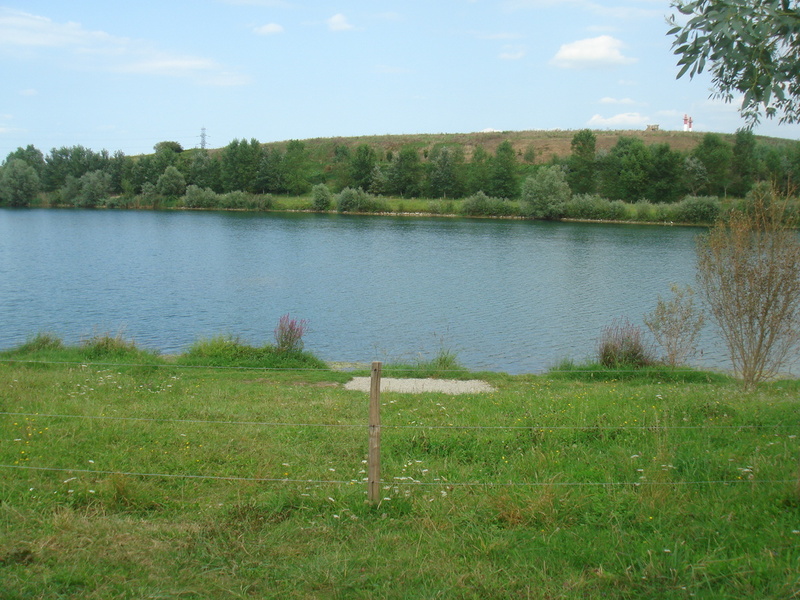 Iktus Carpe, the largest of the 3 lakes, is a 40 year old gravel pit that is over 1 kilometre in length. The property itself is 2 km long. The fresh, clear, water, running down from the Pyrenees is of an extremely high quality. Depths vary between 1m and 10m. The deepest areas lie in front of swim 6. The water is so clear that the anglers can place hooklinks on the lakebed by sight. The deeper areas at the far end of the lake – roughly swims 5 to 10 - feature some snags wheras the rest of the lake has hardly any snags although ther can be some weed during the summer. Iktus Sturgeon and Iktus Run are also fairly deep with depths ranging from 2 to 10m. 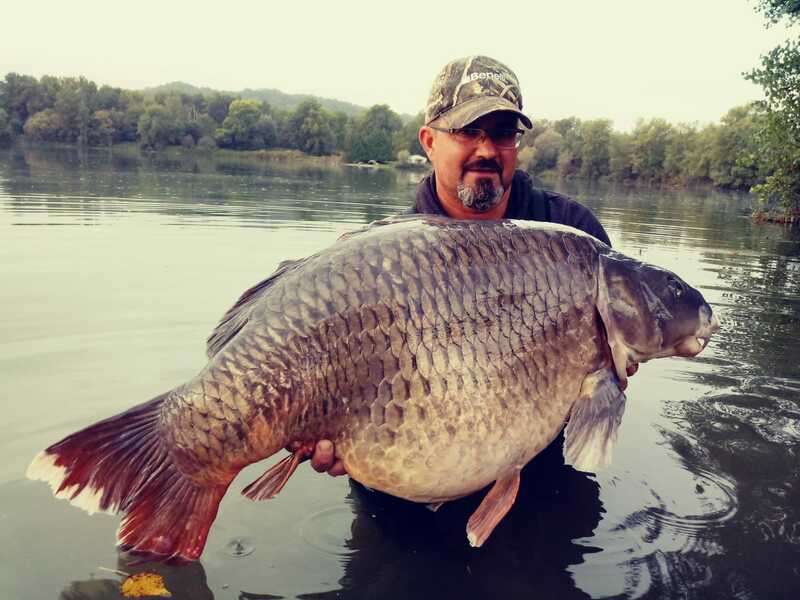 There are a total of 15 swims nestled on the grassy banks of the large lake Iktus Carpe, with 8 swims on the Iktus Sturgeon and 5 on Iktus Run. All swims are big enough for 2 anglers and have easy car access over a gravelled path. After unloading, the cars must be parked on the car parking area (equipped with 24/7 video surveillance), because the whole of Iktus is a protected natural area where cars normally aren’t allowed. The distance between the parking and the swims is considerable so if you have enough space in the car you might want to bring a bike. You can also rent a bike for 30 Euros per week on site. 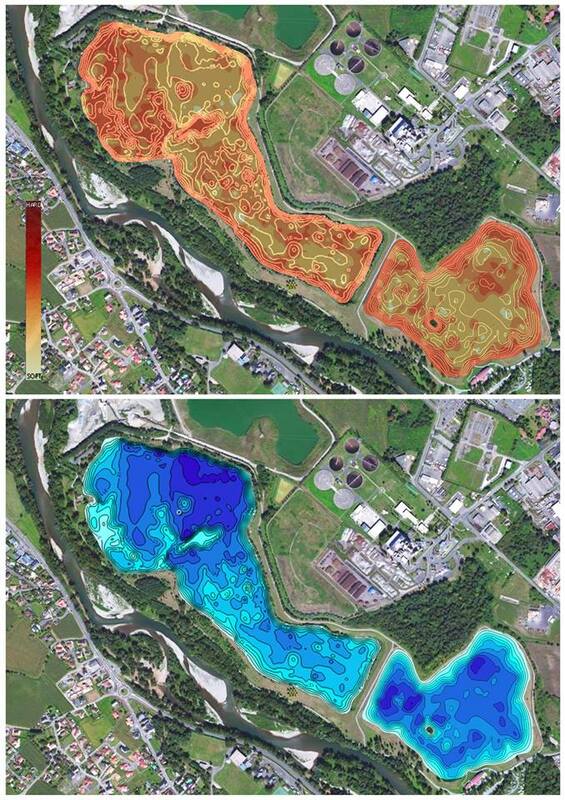 Iktus Carpe isn't an easy lake because of its multiple features. The ‘easy’ swims are in an area bounded by swims 1,2,3,12 and 13. In this area, the lakebed is more even and there are less snags and obstacles. Fishing without a boat is possible. If you just want to cast (and you don’t wish to place hooklinks and groundbait with a boat) choose these swims. However, we strongly recommend the use of a boat with a sounder. The lake features lots of holes, plateaus, overhanging trees and dead trees. This is where the carp live and spend much of their time. This may sound daunting but don’t worry, the bailiff knows exactly where they are located. When you arrive he will explain every detail from every particular swim. He will give you interesting tips that will improve your chances considerably. On the small lake boats are not permitted, only bait boats. Swim 4 is surrounded by trees and has less space than the other swims. Swim 6 has been repositioned recently and the move, of around 200m, has meant that swims 6 and 5 now have a much bigger fishing area. In front of swim 6 the bottom drops to 10m only a few metres from the bank. This is a very interesting spot to fish for catfish and sturgeon. The area between swim 6, swim 7 and the VIP swim have the most snags. Because of this the carp feel very comfortable in this area and from here they go feeding around the rest of the lake. The lake owner and the bailiff removed a lot of dead trees in 2010, but there are still are some obstacles. Before you start fishing, talk with the bailiff and locate all the holes, plateau and dead treas. The machinery in the gravel pit produce background noise, depending on wind directions you hear it more or less. Swim 9 lies about 2 metres above the lake level. Take into account that if you have to net a fish, you have to descend a little slope. This swim is not suitable for every angler. The VIP swim (= swim 8) has the biggest fishable area and it is a very interesting swim. As we already mentioned, the swim is not easy, but if you know how to fish it you will catch for sure. This swim is more expensive because the price includes a little hut with heating, TV, fridge and freezer, two little hobs and even a bicycle. Swims 10 and 11 lie very close to each other and can be a good choice if you want to book a group of 4-5 anglers. There might be some weed formation during the summer months in front of swims 1,2,3,4,8,9,10,11 12 and 13. Normally the weed grows near the banks. In this case, we strongly recommend the use of a boat to place hooklinks, bait and to land the fish. 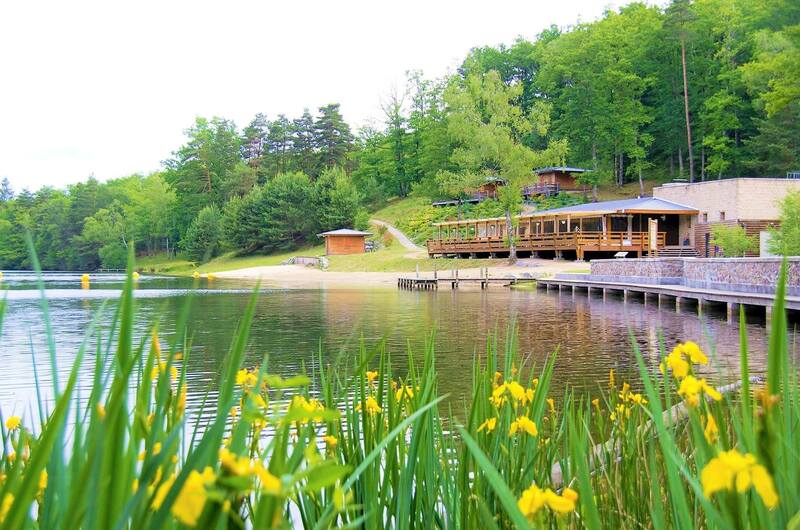 Iktus Carpe is a superb lake where 50 – 60 runs per week are quite normal, but you have to know where to fish. Iktus Sturgeon has a bottom with hardly any obstacles. There can be some weed formation close to the margins but this won't bother you while fishing. Iktus Run is on the far end of the property. Cars can be parked at the swim, but can't be used during your stay. The lake is about 2 km from the facilities, restaurant & tackle shop. Anglers who book swims 24 & 25 must be aware of the power lines that cross the lake. However, they’re quite high so should not be a problem. 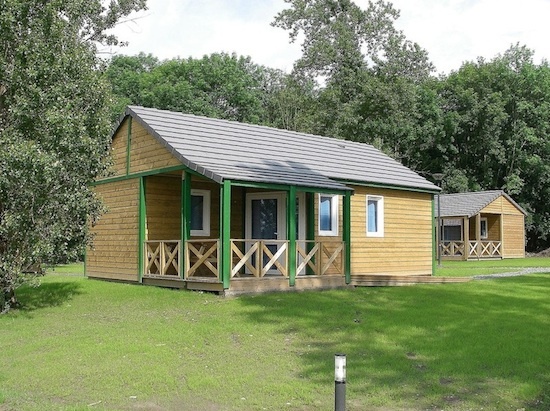 Swims 5, 9, 10, 11, 16, 17, 22 and 23 have a 20m2 chalet for rent for an extra 100€ per week. They are large enough for 2 bedchairs. They don't have electricity or running water. The lake is also stocked with catfish up to 200lb, sturgeon up to 125lb, pike, black bass, etc. There’s no “poisson chat” or crayfish. 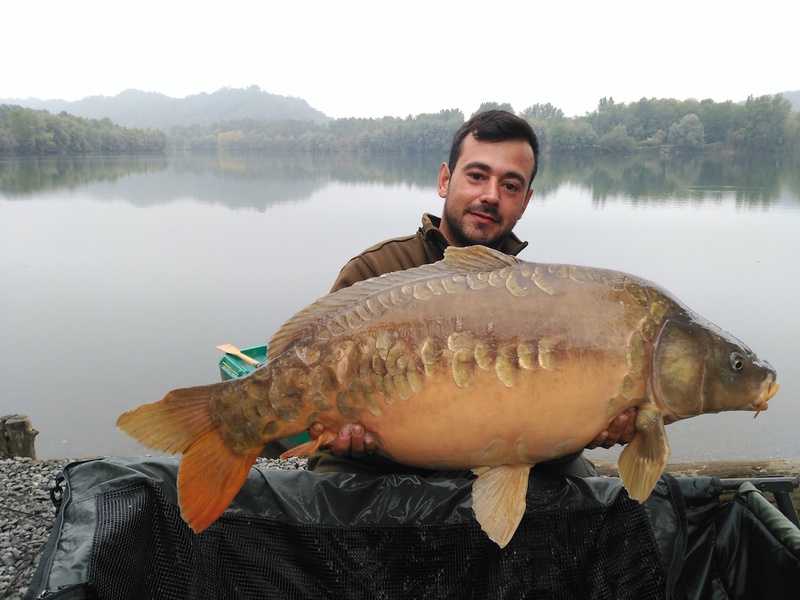 The fish-stock of Iktus Sturgeon consists of about 550 common and mirror carp between 22-45lb, 220 sturgeon of 17 different variants between 20-180 lb, including the French sturgeon record: the stunning 180lb Transmontanus. There are also 30 koi carp between 15-30lb and several grass carp. Iktus Run is stocked with 500 of 15-20lb carp to offer action around the clock; great for novice and younger carp anglers. Our anglers are welcome in the clubhouse every day from 12.00h. They have a small tackle shop and the bar/restaurant has a nice terrace with fantastic views over the lake. There’s a sanitary building at the entrance of the venue with showers, washbasin and washing machine. You can rent your tackle on the site, as well as boats (only the boats from Iktus are allowed, you cannot bring your own boat). At Iktus they also offer a shuttle service from and to the local airport of Pau (operated by several low cost airlines, like Ryanair), situated at about 10 min from the lake. The Pyrenees are a 35 min drive from Iktus. Kids under 15 year are free. Tackle hire: 150 € per week. Number of rooms: 4 --- Kitchenette, Dining room, 1 Shower room, 1 separate toilet, Terrace. Bedding: 1 double bed, 3 single beds, 2 bunk beds, 1 camp bed. Kitchen: Hot plate, Oven, Microwave, Refrigerator, Coffee maker. Multimedia: TV, Cable TV / Satellite TV, Wifi Internet connection. Parking lot belonging to the building, Charcoal barbecue. Access for the handicapped, Washing machines at the disposal of all tenants, Caretaker, Reception desk, Airport transport upon demand. Club House is open from 9 :00h to 12 :00h and from 14 :00h to 18 :00h. Before setting up you must check in at the Club House. DEPARTURE: between 9 :00h and 12:00h. Vehicle access is allowed at low speed to reach the swims and to unload tackle. Cars must be returned to the parking area. Only green or camouflage tents are allowed. No gazebos, please. The sanitary building is open 24h/24h and 7 days a week. Please keep clean. Do not damage trees or vegetation. Please use the bins provided. Do not throw anything into the lake or on the ground (bottle tops and cigarettes ends). Do not wash the dishes in the lake. Please keep the noise to a minimum & respect your fellow anglers. Children must be under adult surveillance. A refundable payment of 50 Euros will be asked at your arrival and will be returned to the client at the departure. Fishing is no-kill. Fishing with life bait and lures is strictly forbidden. Bait boats, bait rockets, spods and the use of Iktus-boats are allowed. (Own boats are not allowed in order to prevent carp diseases.) Please use a life vest. The use of boats is only permitted in the big lake and in the designated fishing zone. Baiting, placing off hook links and exploring the bottom with the boat is allowed. E-motor is allowed. 3 rods only. Barbless hooks, completely flattened barbs are ok. Max. Hook size is n°2. Rods shouldn’t be left unattended. Shock and snag leaders are forbidden. Leadcore is NOT allowed. No braided mainline and the nylon mainline should be between 28/100 and 40/100. Only safe rigs are permitted, rigs that allow the lead to come off in the event of a breakage. Large unhooking mats must be used - minimum size 1.20m x 90cm and they must always be wet before use. Large fine mesh landing nets must be used together with weigh sling with rigid frames. Max. 3 markers per swim. Please fish only in your designated area, do not fish in areas belonging to other swims (even if they are available). All fish caught must be treated with care, kept wet and released carefully. Sturgeon need particular attention as they are fragile fish. They must not be landed in a net - they must be landed by the tail, as there is a danger of breaking their spine. Photos should be taken in the water in order to minimise their time out of water. Carp sacks are not allowed. All fish must be released immediately after a photo. Photos should be taken over a wetted unhooking mat. It is forbidden to stand with the fish. Photos should be taken kneeling. It is strictly forbidden to mark or damage the fish. The management reserves the right to exclude any angler found drunk on the premises without refund.